Here we go again on Fishing in the Discount Bin. I watch a movie, I blog about it. Why? Because I launched a blog 20 years ago, and I haven't moved on with my life! Anyway, this time out, I'm watching Incredibles 2. This is originally in my notes at December 1, 2018. Man o man, I just had a week off work to focus on getting Christmas shopping done, and I wound up picking up a lot of new Blu-Rays for myself. So let's tie into them with Pixar's big offering for the summer of 2018, Incredibles 2. 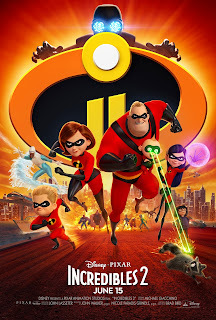 When Pixar went sequel-crazy at the start of this decade, high on everyone's list was a sequel to Brad Bird's 2004 superhero epic The Incredibles. But Bird himself was lukewarm to the idea. He had gone off to live-action town, doing Mission: Impossible -- Ghost Protocol and Tomorrowland. But he pleasantly surprised everyone when, after Tomorrowland, he started saying, "Ya know, I think I finally have an idea for Incredibles 2." And here it was, in the summer of 2018! The film picks up mere minutes after the end of the first film. Our family of superheroes takes down the villainous Underminer and save the city...and are then promptly arrested, because in this universe, superheroes are still illegal. Not only that, but the agency that put superheroes into witness-protection-style new identities has been shut down. Our heroes are homeless, jobless, and on their own. But then, they're approached by the tech billionaires the Deavors...Winston and Evelyn. Winston is a big superhero fan, and wants to begin lobbying the government to make superheroes legal again. Their big plan: get Elastigirl to go back into action (the numbers show she causes the least collateral damage) and launch a massive PR campaign. Our heroes accept, and Deavor sets up the Parr family in a new home. Elastigirl hits the streets and resumes her superhero career, and Mr. Incredible settles into the life of a stay-at-home dad. But of course, there has to be a supervillain, and soon a villain known as the Screenslaver shows up, hypnotizing people through screens and getting them to do his bidding. So it's Elastigirl vs Screenslaver, while it's Mr. Incredibles vs his son's math homework, his moody teenage daughter's teen angst, and his infant son's burgeoning powers. I will admit, I really like the scene where Bob and Helen (that's Mr. Incredible and Elastigirl) discuss whether Helen should do this or not. I mean, we could have done the usual cliched joke about how Bob is masking his true feelings, but no. He's up front and honest. He wants her to do this so superheros can be legalized and he can be a superhero again. It's all very honest and mature...shows some real character growth on Bob's part on the first film. But as I said in my initial review, I really wish Disney and Pixar would give the "trusted friend and ally turns out to be the REAL villain" cliche a rest. SPOILER WARNING. The Screenslaver turns out to be Evelyn Deavor. Turns out the Deavors lost their parents when a couple of burglars broke in. Rather than get the hell out of there or call the cops, the senior Deavors just waited for superheroes to show up, and got killed in the process. While Winston never lost his hero worship for supers, Evelyn, on the other hand, learned that people need to take care of themselves and not rely on superheroes for everything. So her hidden agenda is to discredit superheroes and make sure they stay illegal. Gotta say...she kinda has a point. And another quibble. Winston Deavor is voiced by Bob Odenkirk, and they actually made the character a caricature of Bob Odenkirk. I hate when animated films do that. It pulls me right out of the film. But other than that, it's equally as good as the first film. The animation is great, the characters are great, the soundtrack is great. Everything about it is just great. Incredibles 3, please. But I'll settle for a Frozone solo film.